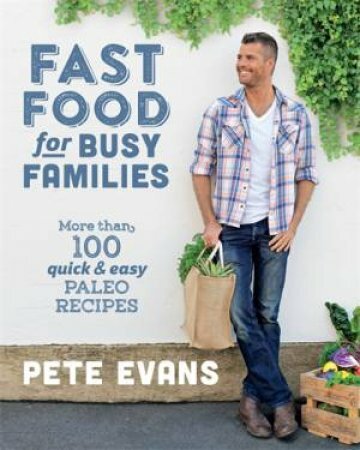 Much-loved Australian chef Pete Evans shows that the paleo way of eating and living doesn't have to be time-consuming or costly, with over 100 no-fuss meals for busy people. Fast Food for Busy Families is packed full of delicious and nourishing recipes - most of which can be made in around 30 minutes. Pete also proves that saving time doesn't mean cutting down on flavour - he shows you how to make the most of spices, herbs and good fats to bring flavour to even the simplest of dishes. Chapters include breakfasts, kids' lunches, salads, main meals, sides and basics, and there are heaps of quick ideas for snacks, salad dressings, entertaining and lots more. All of the recipes are full of fresh veg, ethically farmed meats, sustainable seafood, nuts and seeds, and completely free from grains, dairy, refined sugar and legumes. It's never been so easy to eat well, and look and feel amazing.